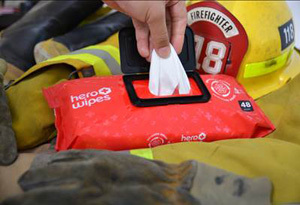 The Technical Advisory Board (TAB) of INDA will choose finalists that, in their view, exemplify innovation within the wipes value chain and advances the use of nonwovens. If TAB determines that a product or technology nominated for the World of Wipes Innovation Award® is better suited for an alternate INDA Award (e.g., RISE® Innovation Award) TAB will remove the candidate from the list of nominations and submit it for consideration in the applicable award category. 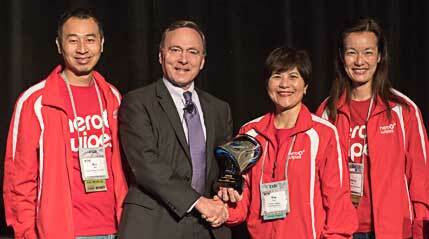 Finalists will present their innovation to the industry at the World of Wipes (WOW®) International Conference. Voting shall be weighted equally across three voting bodies: (1) INDA’s Technical Advisory Board (TAB), (2) the affiliated Conference Committee and (3) the respective registered Conference attendees. Each group shall vote separately and be given equal weight in the final determination of the award winner. Once the weighted votes have been tabulated onsite, the winner will be announced during the scheduled conference hours. Chicopee's new short-term use disposable microfibre mops for cleaning provides a total disposable solution for Facility Management and Cleaning companies looking to improve hygiene or remove laundering of their cleaning materials. The patent pending innovative Fluid Mopping System combines a light, ergonomically designed mopping tool with short-term use Microfiber Mops. The tool has a removable reservoir, which can hold up to 620ml of cleaning solution, and the user pulls the ergonomic trigger to release liquid as they clean. Up to 80 percent less water is used and chemical consumption is reduced, bringing cost and environmental benefits. The system combines the company's unique APEX® technology with splittable microfibre technology to create unique 3D materials, according to the company. The product enables damp floor mopping as opposed to wet floor mopping, which is important to help reduce the risks of slipping on wet floors while mopping in commercial settings. Tecnu® Bites & Stings™ combines new technologies, unlike any other in the market, to provide immediate relief from insect bites and stings. The unique patent pending drug application technology applies a patented anti-itch formula to an affected area. The dual sided wipe features a micro abrasive textured surface on one side and a soft surface on the other. Using the micro abrasive side of the wipe allows for deeper penetration of the medication into toughened skin. While the soft side is for use on more tender areas. The ScrubSingles Kitchen pad is a hybrid wipe and sponge loaded with Clorox® cleaner. The ScrubSingles formulation and nonwoven has been optimized for generating foam, allowing users to clean while minimizing fear of damaging surfaces. An innovative, game changing, non-woven rechargeable food service towel that indicates the towel is cleaning. Be sure you're sanitizing. Now Sertun™ Recharagable Sanitizer Indicator Towels take the guesswork out of sanitizing. You – and your wait staff – can be sure you're effectively sanitizing any surface with revolutionary Color Check Technology™ built into every Sertun™ Towel. Sertun™ Rechargeable Sanitizer Indicator Towels are an innovative, nonwoven rechargeable food service towel that indicates by color when the towel is cleaning and when it needs to be recharged in cleaning fluid.